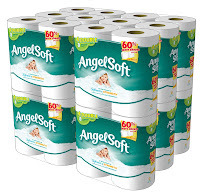 Amazon has an incredible deal on Angel Soft Double Rolls (48 ct.) for $21.29. Plus then is a $1.00 off coupon, making them $20.29. That's $0.42 a Double Roll! This is an awesome stock up price! This item is eligible for FREE shipping on orders over $25. An ideal balance of softness & strength. Angel Soft Bath Tissue is made with 2 SoftShield Layers so it holds up better than ever when wet, making it a smart choice for your family and budget. All the softness you want, all the strength you need at a great value!